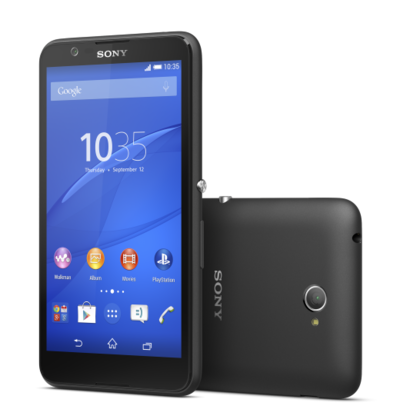 Sony's new Xperia E4, a midrange offering that was announced early last week, is now available to pre-order in the U.K. through smartphone retailer Clove.co.uk. The device is priced at just £99 (approx. $150), and shipping is expected to begin in late March. The Xperia E4, which will likely make its public debut at Mobile World Congress next month, is Sony's answer to affordable offerings like the Moto G. It has a 5-inch qHD display, a 1.3GHz quad-core processor, 1GB of RAM, and 8GB of internal storage. Adopters also get a 5-megapixel rear-facing camera, a microSD card slot, and a 2,300mAh battery that Sony says will provide up to two days of use in between charges. There is no 4G connectivity, however — it's 3G only — and the Xperia E4 will ship with KitKat rather than Lollipop. It may not be the most exciting handset we'll see this spring, but the Xperia E4 could be a great choice for smartphone shoppers looking for excellent battery life in a capable device that won't break the bank. While Clove says that "official pricing" isn't available yet, the company is charging just £99 (approx. $150) for pre-orders. You can get the device in both black and white, and it's expected to begin shipping later next month.